The path of space exploration is made of rocks. Unveiling the secrets harbored by minerals in other planets and moons requires testing advanced technologies right here on Earth. One of the experiments carried out during the latest PANGAEA-X test campaign in 2017 discovered water-related minerals in the volcanic landscapes of Lanzarote, Spain. “We are paving the way to learn how and where to search for life, but also for new worlds to live in. Expect the unexpected,” says Jesús Martínez-Frías, professor of planetary geochemistry at the Geosciences Institute in Spain. As an expert in mineralogy, Jesús helped to collect and analyse hundreds of samples of rock, soil and dust around dormant volcanoes. The results collected by the PANalytical experiment confirmed his best expectations. “We have detected for the first time previously unidentified water-related minerals. The list is long and promising: we have found oxides, oxy-hydroxides, clay minerals, zeolites, carbonates and sulphates,” he explains. These minerals are crucial to determining what type of biomarkers tell us about habitability conditions – past and future – not only on our planet, but also on the Moon and Mars. 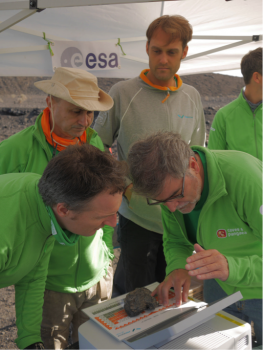 The results confirm the relevance of Lanzarote as an exceptional site for field campaigns such as PANGAEA-X and further astrobiology research studies. “We have discovered new pieces of the geological puzzle of the island, we can better understand its geological context. The basalts we found make it a good Moon analogue, while the water-related minerals are useful for Mars habitability studies,” adds Jesús. The collection of high quality spectra of volcanic minerals was made possible by two portable devices: the TerraSpec-Halo spectrometer and Epsilon 1 X-ray fluorescence spectrometer. “We are pleased that our technology allowed the team to identify yet unknown spectral signatures,” says Lieven Kempenaers, principal investigator from Malvern PANalytical, a scientific instrumentation company with worldwide customers in many industries such as mining, building materials, petrochemicals and pharmaceuticals. 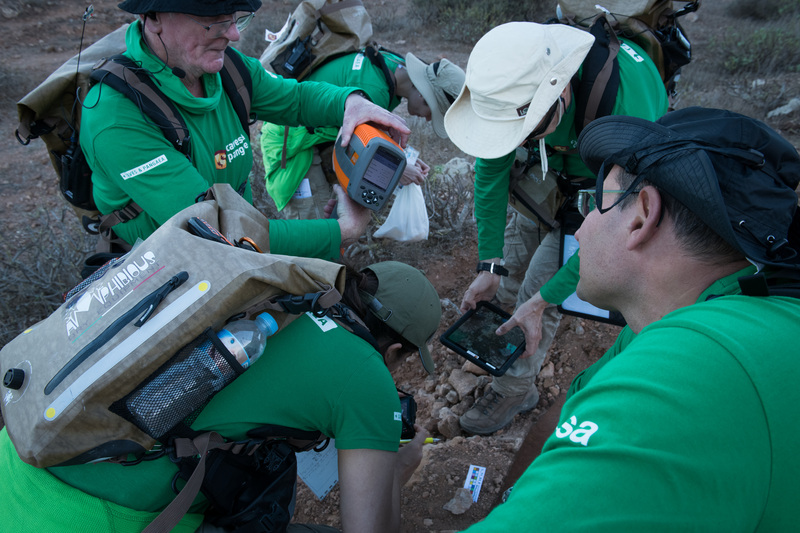 While the Halo spectrometer has been screening rocks with PANGAEA since 2016, the Epsilon 1 device was a newbie to the test campaign. “These two complementary devices could rapidly screen the minerals and identify its chemical elements. They told us the story of the rocks in-situ,” adds Lieven. 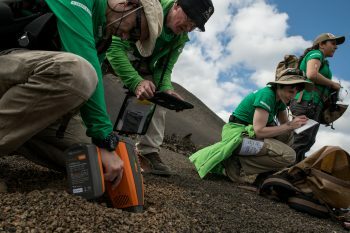 The PANalytical instruments allowed PANGAEA participants to measure hundreds of samples and multiple spots in the same sample. All procedures were automated, and they took from seconds to 30 minutes, according to the precision required. 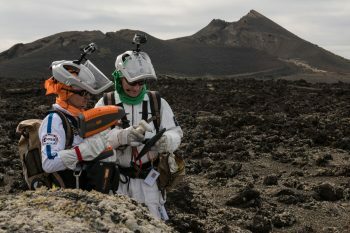 ESA astronaut Matthias Mauer used the devices throughout the campaign. “These tools are a huge asset for the crew to gain quick non-destructive measurements on the spot. They are easy to use, and even without being a professional geologist I could perform autonomous activities with scientific relevance,” he says. 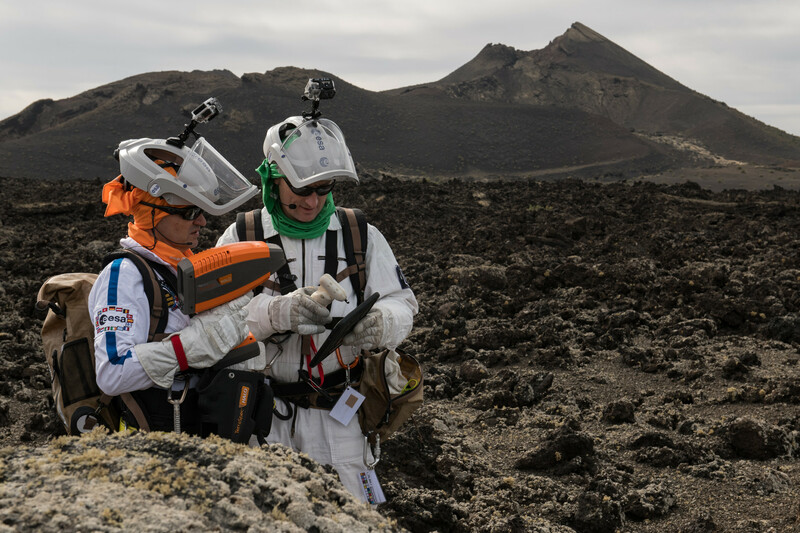 The astronaut’s feedback resulted in an upgrade to the Epsilon 1 device for the upcoming PANGAEA 2018 campaign – the device will now be equipped with a small camera to take pictures of the sample. This new feature adds valuable visual information for the identification of minerals. The versatility of the instruments does not end here. “We are thinking about mounting components of the Epsilon X-ray instrument on a scouting rover in the future,” explains Lieven, who sees the campaign as an ideal scenario to test operational strategies for planetary surface geology. “We are not lacking in ambition. We dream of sending our technology to the Moon,” Lieven says.